Feynman Day comes Sunday; celebrate with your mother, and fly the flag! May 11 is the anniversary of the birth of Richard Feynman (born 1918, died 1988). In 2014, his birthday falls on Sunday, Mothers Day. Mothers Day is one of the designated-by-law days to fly the U.S. flag — so fly your flag! You can tell your mother it’s for her — but it’s also for Richard Feynman. Why Feynman Day? To celebrate invention, physics, interesting characters, and that essential, American quality of je ne sais quoi. In addition to his winning the Nobel Prize for Quantum Electrodynamics (QED), Feynman popularized the critique of science and other enterprises with what we now call Cargo Cult science, or education, or whatever, where people follow the dance steps, but without the rhythm and music. Those two things alone would make him a remarkable man. But, like a product offered for $19.95 as a good buy in a 2:00 a.m. infomercial, with Feynman, there’s more. With Feynman, there is always more. I got alerted to Feynman in the first days of the old Quality Paperback Book Club, when they featured his new memoir, Surely You’re Joking, Mr. Feynman! QPBC was hot on the book, and with a title like that, how could I resist? When I got the book a week or so later, I read it within two days, while attending law school and working full time. I remember Feynman. A New York Times bestseller—the outrageous exploits of one of this century’s greatest scientific minds and a legendary American original. In this phenomenal national bestseller, the Nobel Prize­-winning physicist Richard P. Feynman recounts in his inimitable voice his adventures trading ideas on atomic physics with Einstein and Bohr and ideas on gambling with Nick the Greek, painting a naked female toreador, accompanying a ballet on his bongo drums and much else of an eyebrow-raising and hilarious nature. All true, and that’s not even the half of the outrageousness, all done with great good humor, about a life lived in great good humor through what should have been a memorable age, but often was just terrifying. I think sometimes that Feynman’s calm, alone, borne of that great good humor and insatiable curiosity, may have gotten us through the birth of the atomic age and the Cold War. Feynman’s high school sweetheart, Arlene, came down with tuberculosis. He married her, and took her with him to New Mexico to make the atom bombs. The stories of her confinement to a hospital, and the laborious trekking he had to make between Los Alamos and her bedside in Santa Fe, are touching, and heartbreaking. It is one of the great love stories of the 20th century, certainly, and perhaps for all time. It also provided the title for his second memoir, What Do You Care What Other People Think? Yeah, he’s already been featured on a postage stamp, see at right. That’s not good enough for Feynman, though — the U.S. Postal Service created a special cancellation stamp for Feynman, featuring a version of his Feynman Diagrams. The Feynman Diagram used for the postal cancel on this envelope depicts what is known as a “bubble process.” It shows a high energy particle, for example, a cosmic ray (a) from a distant supernova, which emits a high energy photon, for example, a gamma ray (b). The photon, in turn, creates a particle (c) and an anti-particle (d) that exists for a brief moment and then recombines. Working at Los Alamos on the Manhattan Project, Feynman developed a keen appreciation for bureaucracy and all its follies. His vexations for the security managers are also legendary. Here’s a quick version of one story — he asked friends and family to write to him in code, but to not include a key to the code, so he’d have to crack the code to read the letter. Feynman could do it, but the security people couldn’t. Hilarity ensued. 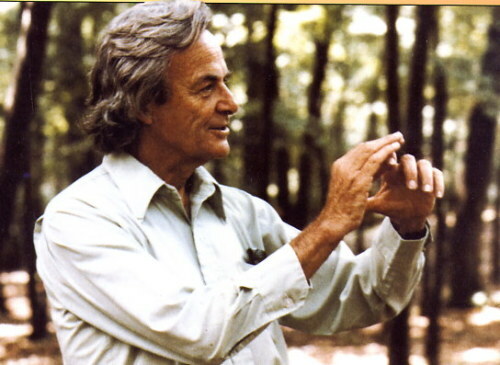 Feynman developed a love for the still-relatively unknown, landlocked Asian nation of Tannu Tuva. It’s just the sort of place to appeal to a character like Feynman — so obscure most atlases didn’t, and don’t, show it at all — seemingly consumed by the Soviet Union, but held in a special status. Home of throat singing — and almost impossible to get to. During the Cold War, Feynman struck up correspondence with people in Tuva, to the concern of Soviet and American intelligence agencies, who seemed not to understand someone might do such thing out of curiosity. Feynman hoped to travel there to visit new friends, but his final bouts of cancer took him before it was possible. Tuva, famous among philatelists only, perhaps, honored Feynman with postage stamps and postcards. Just try to find a photo of Feynman not smiling. The man was a joy to be around, for most people, most of the time. Quantum electro dynamics? No, I can’t explain it, either — but his work had a lot to do with how particles wobble. I remember that because, according to Feynman, he got the inspiration for the work for which he won the Nobel while spinning plates, like a Chinese acrobat on the Ed Sullivan Show, to the delight of students in the Cornell University cafeteria, and the shock and horror of the food service people. Who else has yet confessed to such an inspiration for a Nobel? There’s more — a lot more. Feynman outlined our current generation of computer memory devices — in 1959. No, he didn’t patent the idea. He did patent an idea for a nuclear-powered spacecraft. Another delightful story. Feynman was featured in print and broadcast ads for Apple — not one, but two (did anyone else get that honor from Apple?). “Think Different.” This is one of Apple Computer’s most successful advertising campaigns. The theme of the campaign is one that celebrates figures in history who changed the world by thinking differently. Richard Feynman was among the chosen figures. Feynman served on the board that approved science books for the California school system — his stories of that work will shock some, but it will make others shake their heads as they recognize the current crop of cargo-cultists and political bullies who dominate textbook approval processes, knowing nothing at all about what they are doing, or why. No, I didn’t forget his brilliant work on the commission that studied the Challenger disaster, for NASA. There’s so much stuff to glorify! In history, Feynman should be remembered much as we remember Thomas Jefferson, as a renaissance man in his time, a man who put great intellect to great work for his nation and all humanity. The sages say we shouldn’t have regrets, but I do have one. When the Challenger Commission was meeting in Washington, D.C., I was working on another commission up the street. I knew Feynman was ill, but our work was important, and we’d heard his disease was in remission. I didn’t goof off a day and go to any of the hearings to see him, to get an autograph, to meet the man. I though I’d have other opportunities to do that. Now I regret not having met him in person. In print, and in film, I know him well. In our family, reading Feynman is something everybody does. Feynman’s memoir was one of the last books I read to our son, Kenny, as he was growing up, and growing into reading on his own. Even reading about Feynman, together, was an adventure. Our son, James, took us into the real physics of Feynman, and though I struggle with it more than James, we still read Feynman, for humor, and physics. What would be appropriate ways to mark Feynman’s birth? At some future date, I hope we’ll have public readings of his books, showings of the documentaries about him, recreations of his lectures, perhaps. And then everyone can get in a circle, beating drums and singing about getting some orange juice, before sending postcards to our friends in Tuva. Richard Feynman, we still need you, and miss you dearly. Tuva’s capital is the delightfully-named Kyzyl. From this map, can you figure out where Tuva is, or how to get there — without Google, or Bing? Tuva postcard, in honor of Richard Feynman — who loved to drum. Do not miss the Friends of Tuva site, which is as much a tribute to Feynman from his good friend Ralph Leighton as it is a tribute to the great little nation of Tuva. Have a great Feynman Day! Much of this is an encore post. This entry was posted on Friday, May 9th, 2014 at 10:10 pm and is filed under Biography, Books, History, Humor, Life, Physics, Science. You can follow any responses to this entry through the RSS 2.0 feed. You can leave a response, or trackback from your own site. 5 Responses to Feynman Day comes Sunday; celebrate with your mother, and fly the flag! One of my lasting regrets is my failure to goof off from work and walk the two blocks to the Challenger Comission hearings, to meet Feynman. I did not realize he was so ill at the time. I rather envy your meeting him. Thanks for the story! Of course. What was I thinking?